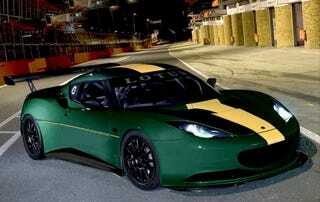 Compared to the road legal car its based on, the Lotus Evora Cup has lost 440 Lbs and gained 115 HP. Colin Chapman would be proud, especially of the amount of "speed" it'd buy him with its $195,000 price. The Evora has gained its newly found power thanks to increasing the Toyota-sourced V6 from 3.5 to 4.0 liters; it's also gained a dry sump to resist high cornering Gs and a six-speed sequential gearshift. Those extra Gs will come partially courtesy of a new aero package designed by Dallara. Lotus achieved the added lightness by ditching any parts that were there just for street-legality and comfort and replacing some of the few remaining bits and pieces with lightweight alloy or carbon fiber components. Designed for international GT4 racing, the Evora Cup is also getting its own one make series in Europe, creatively named the Evora Cup.